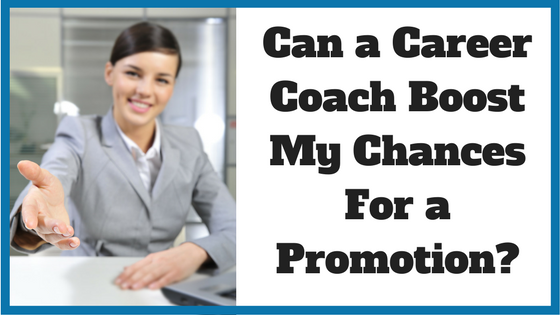 » Can a Career Coach Boost My Chances For a Promotion? Can a Career Coach Boost My Chances For a Promotion? If you’ve recently been turned down for a promotion, it’s pretty likely that your emotions have taken over your logic. At this point, it’s hard to really understand why you didn’t get the promotion and a coach can help you answer this important question. Experienced coaches know that self-awareness is vital in achieving career goals and as a result will help you view yourself as others view you. The coach will have a look at the whole picture, such as meeting summaries and performance evaluations and will help you fill in the gaps, so you’ll understand what is needed to successfully compete for your next promotion opportunity. Right now, I can guess that the only goal you have in mind is to get promoted. That’s a good start, but not good enough. Based on an in-depth analysis of your current situation, an experienced coach can help you translate your general goal into a personal action plan, divided into stages and including specific timelines. In this way, you’ll be able to actually work towards your next promotion, knowing exactly what you need to achieve it. With the abundance of “how to be a manager” guides out there, your natural tendency might be to try to transform yourself into something you’re not. A professional career coach will help you develop new competencies while ensuring that what makes you stand out as a manager is still is preserved. This is the winning combination you need to get that next promotion. A professional coach can help you make it or break it when it comes to your next promotion. It’s important to remember that like all successful partnerships, it takes effort from both of sides. And always remember: Great managers are made. Not born. Thinking of hiring a career coach to help you reach your full professional potential? Browse our directory of career coaches and get a FREE consultation or request a personalized coach recommendation! Etika founded her blog - Great managers are made. Not born. - based on 35 years of field research and experience in empowering mid-level executives to achieve the promotions they deserve. Reach out to Etika on LinkedIn, Twitter, or Facebook.